Over the next few weeks I've decided to write a manifesto of sorts about a few convictions I've picked up lately about ministry and the vocation of a pastor. Each one of these is an attempt to concretely state what I believe about being a pastor and how I will approach the ministry of the gospel God has called me to. Some could call it a "philosophy of ministry" and if that's the case, fine, they are what I believe and how I will live and labor. I will arrange each of these "articles" of my manifesto theologically. I think you will see why in time. The pastorate is no place to play around, no place to be glib or trite or foolish about God or what the stakes are in eternity or people's souls. There is no room to waste time, goof off or seek to entertain people with my winsome personality or self-inflated ego. The pastorate is first and foremost about God. If I read my Bible right that means I stand before a God who is absolute in His holiness. I minister on behalf of a God who is a "consuming fire," a "warrior... majestic in battle," one who "comes in fire and His chariots like the whirlwind." I display to the world the glory of God by my life and by my words. I cannot be trite about God. Yet the pastoral vocation first and foremost isn't about people; it's about God. It's a man declaring with his words and displaying with his life and directing with his time people to God. It's one who is made in the image of God, gifted by the Holy Spirit of God, called by the Word of God and burdened with the gospel of God to show and say who God is. And if this is the case concerning pastoral ministry then the pastor, then I, must be attentive to and knowing God first and foremost. My time should be with God. My words from God. My counsel, God's counsel. My worship unto God. My life fixed and devoted to God. The pastorate is about God. Any other center or focus is an idol, and God doesn't share glory. Yesterday I posted about a trend I have noticed in the last few years of the major influencers in evangelical Christianity today sounding a call to return to the city and give yourself to its service and betterment. In arguing against an idolatry of the city for the sake of its inherent bigness I committed the logical fallacy of moralizing two amoral positions. The argument works like this; if Proposition A is undesirable then its opposite, Proposition B is not only superior but morally upright as well. I see this fallacy all over the place. For instance, when it comes to educational choices, I've seen some argue in favor of public schooling because of the missional impact it can have. In demonstrating the superiority of their position they moralize the discussion and in so doing make everyone who doesn't send their kids to public school to be people who don't care about the lost. The home-schoolers do the exact same thing. In showing how much better it is to homeschool your children the issue becomes a moral one (usually centered around a misinterpretation of Deuteronomy 6), and anyone who doesn't homeschool their children is "feeding them to the wolves", or so the argument goes. How does this apply to my post yesterday? Well, I realized about 2:45pm yesterday that I had played the ultimate trump card in my attempt to illuminate the idol of urban ministry being better ministry. I moralized the issue in Jesus' name. Basically I argued that because Jesus didn't predominately hang out in the cities the implication that I brought to out is that our missional strategy should reflect that. Jesus didn't start there, neither should we. However this is silly and wrong on my part. We need both. We need strong, robust urban ministry and a deep influx of church planters and churches in the heart of the urban core. Many missiologist are right, the Bible ends in a city, the City of God. However we need the same strong, robust rural and suburban ministry as well. We need a movement of church planters and gospel-centered churches in the small towns, villages and outskirts of the cities. Much of the Bible takes place in the little places. Simply put we need both, and we can't and shouldn't make villains out of the other side. Those who have an idolatry of the big city and think that God only (or most powerfully) works in the city need to repent and recognize God's grace in the little places. Those who have an idolatry of the small town and think that purity and holiness are preserved only in them need to repent and rejoin their brothers' efforts at the advance of the gospel in the city. In either case we cannot reject the other. I'm not going to redact my post yesterday. I think it is still helpful for us to be careful not to forget the little places and hopefully that post will serve as a reminder of that. I do, however, want to call your attention to how you logically argue for a position that is amoral, or without inherent morality assigned to it. If it is not an issue of right and wrong, do not make it one that is. Educational choice, music styles, what you wear to church, or issues like urban vs. rural in no way need to be argued from a position of "moral rightness." Why? Because they are all right, and they can all be wrong too. Grow in wisdom and you'll be able to figure out which is which. There has been a lot of talk these days about the church being influential in the midst of a large urban core. Instead of evangelicals abandoning the city centers and moving out to the suburban and rural areas of our country the predominate thinking is that the river should flow the other way. Plunge into the city — that is where the people are. Dive into the heart of a city — that is where the cultural influencers are. All for the city! That is where the artist who will make it all beautiful live. Run into the city! Everything else runs the other way. Now, in no way am I against the city and the efforts of many today to go into the hearts of the city and reach the lost with the gospel. I am grateful that actually there is a renewed interest in urban mission. While I lived in inner-city Chicago I knew there was a place and people that desperately needed the gospel. The elite rich lived to the east of me. The destitute, ghetto poor lived directly to the west of me. The cities need a gospel advance in a deep way. However there seems to be a growing idolatry of the city. Maybe it has to do with American value of "big equals success" and therefore big churches equals big success and the sure-fire way to get that influence, prominence and notoriety is to be around a city. But was that Jesus' methodology? As I read the Gospels this week I'm noticing something about Jesus. Unless he absolutely had to, he avoided the cities. Jerusalem was the primary city in his region and it seems like He couldn't stand to be there. If you look up the places where Jesus ministered they were the rural villages and towns of the Northern country. Places of agrarian and pastoral life. Nazareth probably wasn't more than a couple hundred people. Capernaum, the largest town in Galilee and the regional base of Jesus' ministry was by best estimates no more than a thousand folks. In fact most of Jesus' three and a half years of ministry was not spent in the cities hanging out with the influencers and financiers while reaching the artist and "culture-makers." The bulk of Jesus ministry was spent with fishermen, shepherds, towns people in small and seemingly insignificant places. The city wasn't a refuge or strategic center for Jesus. His strategy wasn't to reach the wise, strong, rich, proud, or famous. He lived amongst the forgotten, weak, marginalized, poor, every-day-man. Instead of the river flowing from city to village, Jesus turned it backward. He worked through the little and river flowed the other way. By influencing the small and powerless the river went upstream and the large and influential cities of Jerusalem and Corinth and Rome were impacted by the gospel. Shouldn't our mission strategy reflect the same? My recollection of the book of Acts tells me the apostles continued working from the small up to the city. Maybe the river flows the other way? Maybe we've forgotten. Is The Church Too Complicated? I'm in the midst (almost half-way) of a two month leave of absence that my church has given to me finish the writing portion of my final Masters degree project. Recently I have been thinking about the nature of the church, my soul and pastoral ministry. I guess being away from the occupation that has defined me for the last decade is bringing some reflection and maybe a dose of clear thinking about it all. Maybe not. On top of this, the pastor's vocation has become less about being a holy man of God before the people of God bringing God to bear upon their lives through Scripture, prayer and direction and more about being a "leader of leaders" who "vision-casts", "dynamically communicates relevant truth" and "organizes and builds an emerging church." Frankly the job descriptions of most pastors today looks like a side-show circus clown trying to make a name for himself than the shepherd-leader role found in the Scriptures. Where is the prayer? Where is the Scripture? Where is the man who is so affected by the holiness and glory of God that the church burns brightly with zeal for that same God, not because another program happened, but because when the church gathered they saw God? You see this is where I think the church has become too complicated. A billion-and-a-half programs from infancy to rigor mortis isn't helping. Prayer. Scripture. People. I think that's about as complicated as the Bible gets about the church. As Eugene Peterson describes it, prayer brings us to attention before God, Scripture helps us attend to God's words and ways, and we sit in the attention to people in which God is working and redeeming daily. This forms the triad of church life and pastoral vocation. Simple. This is the first volley of my thinking on this... more will follow. This is a great article from Yancey Arrington... be careful how you think about the church! To examine the church in the New Testament is to witness God’s people on mission for the Gospel. Church is seen as an identity – who we are (a Gospel Community) – which informs our activity (a Gospel Mission). 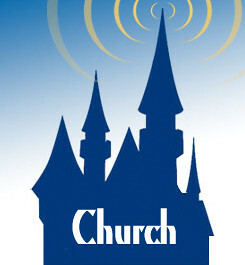 However, the pervasive perspective today on church is something more akin to Disneyland. Church is seen as a destination, an end-point, a place we simply go on Sundays. This ‘church as destination’ viewpoint can cultivate in us harmful ways to think about church. It feeds our consumer mentality. Think about a trip to Disneyland. We evaluate it based on what we get out it, not what we put into it. Were the rides fun, did they meet my need for excitement, did they greet me well, did I have to spend a lot of money, etc.? Destination-understanding does the same with church. Church becomes ‘good’ or ‘bad’ based on how we felt about the sermon, the song selection, the fact whether or not we were warmly greeted and other aspects of our experience that Sunday morning. Church becomes just one more thing in life that exists to entertain us or meet our demands. But the church is about the people who compose it living on mission in the world. In other words, the church is not about just coming together but being sent out. Church is more like a soldier’s experience at Fort Hood than a Mickey Mouse fanatic at Disneyland. Troops arrive at Fort Hood knowing they will be encouraged, trained and equipped in order to ultimately be sent out to their real destination. The mission is not at Fort Hood but somewhere else. The same is true of church. The real destination of the church’s mission lies not within the four walls of the building but outside of it. God’s mission is best accomplished not when we come to church but when we leave it. Destination-oriented thinking loses sight of this critical truth. It provides a false definition of faithfulness. Growing up I would say a faithful church member was one who regularly attended Sunday services. Since I saw church as merely a destination, I gave people the same marks I’d give to those who make an annual pilgrimage to Orlando or Anaheim. Some are faithful to church. Some are faithful to Disneyland. When something’s just a destination, attendance is the metric. But if the church is really a people on Gospel mission in the world it seems rather ridiculous to consider attendance as the true mark of fidelity. Attendance indicates that a person has mastered the art of sitting (maybe even singing and listening as well). It doesn’t indicate how well they are trying to reach the community where they live, how hard they work to display the Gospel in all areas of their life or the amount of time they’ve spent in prayer on behalf of those far from Christ. Think again about a soldier and Fort Hood. Do commanding officers ultimately base the fidelity of soldiers on their presence at boot camp or their execution of the mission once upon the battle field? Pretty easy answer. Church should no different. Faithfulness is best evidenced not by what people do inside the church Sunday morning but what people do outside the church the Monday through Saturday. It contributes to compartmentalization of life. Church as destination leads Christians to think that ‘church’ is more a place you go than a mission you live out. It’s a place like school, work and the gym are places – different segments which have a life of their own. Thus we have a work life, school life and now…church life. As such, we come to church on Sunday (for church life, of course) then leave the doors to go back to the real world. Complicating this is the idea, like Disneyland, church is the place we go to escape from the real world. We go to church, live briefly in that world for an hour or two every month or so then return to reality. Everything is compartmentalized. Church is left in a nice but fairly impotent box: church world…or even worse, church fantasy world. But when church is seen as living out the Gospel mission in the world, the compartments of our thinking begin to break down. Like Fort Hood, I begin to see Sunday mornings as helping me to better live out the mission of God in the world. Not the fantasy world but the real world. Church becomes a type of spiritual boot camp that is integral for the real world, not independent of it. In other words, there is no church world/real world dichotomy. The mission tells me they are one and the same. I am sent by Jesus for Jesus into all areas of my life for his Kingdom’s sake. That is the mission. Church isn’t just a place I go, it isn’t just something I do on Sunday mornings from time to time. It is who I am. Is is who we are. So how do you see church? Are we getting in the way of the gospel? Are we believing the gospel? Are we relying on the power of the gospel? Are we getting the gospel out? Are we getting the gospel right? Are we adorning the gospel with good works? Are we praying for the work of the gospel? Are we training up our children in the gospel? Are we trusting God's sovereignty in the gospel? These are profoundly good questions and ones that need to be at the focus of our self-evaluations. I encourage you to pick up the book and check through the fuller descriptions of each question on pages 32-36.